TMS Europe manufactures a range of highly accurate dry-well Block Calibrators for the calibration of temperature sensors. We offer small hand-held and compact portable models with temperature ranges up to 500°C and sub-zero models down to -25°C (35 degrees below ambient). A TMS Block Calibrator is a valuable tool for calibration and validation of thermocouples, resistance thermometers and thermostats. Simply insert your temperature probes into a pocket of the metal block, set the temperature on the digital controller, then wait a short period for the PID controller to stabilise the block at the set temperature. Probe readings can either be compared to the controller/indicator measured temperature or, for greater accuracy, compared with a calibrated reference thermometer standard inserted in the block. We also offer reference thermometers with UKAS calibration. Our Block Calibrators accept probes of various sizes, and our UBC series uses a range of interchangeable sleeve inserts to best fit your probes. The UBC2001 and UBC2010 models also feature a Thermostat Test Circuit that indicates when a connected thermostat switch has opened or closed; letting you check what temperature it is switching at. We offer optional UKAS (ISO 17025) calibration and surveys of our Block Calibrators, as well as a choice of supply voltage and plug to suit your location. With a wide range of models and options to suit your needs, TMS Europe’s calibration heat sources are ideal for calibration work, on-site or in the laboratory, or as part your quality and traceability regime, such as for ISO9001, HACCP, HTM2010, etc. 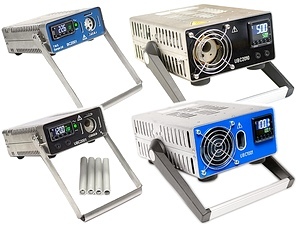 For performing higher temperature calibrations see our Portable Calibration Furnaces, which are designed for on-site temperature calibration between 400 and 1100°C. A very compact, highly portable block calibrator, offering the higher accuracy of a single fixed block, with multiple 100mm deep wells for various probe sizes. A very compact, highly portable block calibrator, offering the versatility of interchange sleeves to cover a wide range of probe sizes. Takes Small Sleeves; 13mm OD by 100mm deep. It features a thermostat test circuit. A compact, portable, sub-zero block calibrator, offering high accuracy and the versatility of interchange sleeves to cover a wide range of probe sizes. Takes Small Sleeves; 13mm OD by 100mm deep. A compact, portable, sub-zero block calibrator, offering high accuracy and the versatility of interchange sleeves to cover a wide range of probe sizes. Takes Large Sleeves; 19.3mm OD by 140mm deep, and, with an adaptor sleeve, Small Sleeves; 13mm OD by 100mm deep. It features a thermostat test circuit.